Amy’s not ashamed to admit—if she didn’t have Scratch, she’d eat everything she bakes by herself. She developed her sweet tooth as a kid, when her parents let her have marble cake for breakfast on Saturday mornings. Today, she still enjoys the occasional treat with her AM coffee, and believes that as long as they’re made with fresh, real ingredients, there’s nothing wrong with eating cookies for breakfast. When she’s not hand-mixing scone dough or perfecting new recipes, Amy is hard at work in her other career as an advertising copywriter. Though it’s what she earned her college degree in (ironically, a B.S. ), she won’t hesitate to tell you that Scratch is her true full-time job. 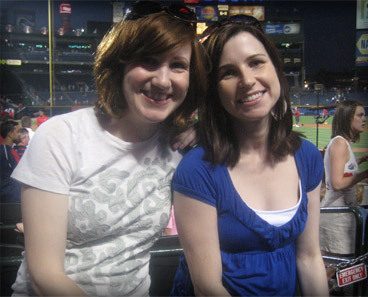 Jenn and Amy met in 1999 as randomly-paired roommates at Boston University. They clicked almost immediately, and have been best friends, travel buddies and each other’s biggest cheerleaders ever since. Though she lives in New York and is an Associate Art Director for a major women’s magazine, Jenn is responsible for all of Scratch’s incredible packaging, identity and collateral design. She also serves as our idea consultant and overall moral support—which, if you ask her, can be a 24/7 gig. Scratch began as a way to bring more joy to everyday life—by making people smile, encouraging mid-day scone breaks and recapturing the warmth of fresh breads at the breakfast table. But there are so many people for whom joy has a different meaning, whether it’s finding a safe place to sleep at night or fighting back against a disease for just one more day. Since 2008, Scratch has donated over $1,000 in goods & services to fundraising efforts for the Atlanta Central Night Homeless Shelter, Partnership Against Domestic Violence, American Cancer Society and Share our Strength. Because while cookies bring satisfaction, it’s action that changes lives. And we’re all for a world where “chocolate chip or oatmeal?” is the toughest challenge anyone has to face. What you eat is just as important as what you don’t. That’s why we never add artificial chemicals or preservatives to our products, so you’ll always know your baked goods are fresh, wholesome and free of ingredients you can’t quite pronounce. We show the same care when it comes to packaging, and use BioPlus Earth 100% recycled paperboard boxes, post-consumer recycled labels and certified compostable bags whenever possible. Of course, ordering in bulk and sharing our goods with your friends reduces packaging waste, too. But we completely understand if you’d rather keep all the sweets for yourself.